Remember Starr Mazer? A curious mix of point-and-click adventure and 2D shooter, it took to Kickstarter a while back and looked so goshdarn amazing that it had us crossing every available limb in the hope that it would eventually find its way to Nintendo consoles. It looks like we can finally uncross our aching appendages as we're now being told that Japanese publisher Playism has become involved, and Wii U and 3DS versions are in the works - alongside other console editions, which all launch after the initial PC release. The bad news is that the PC version isn't due until 2017 - so we've got a while to wait before we get our hands on this intriguing title. ermm... Okay. Definitely a 'curious mix', but it could be good. Playism? !? Wow ....I have an account with them ! You had me at 'point and click'. Ammiright? Love the classic p&c's but the genre is all but dead. Can't understand why it would need all this time to arrive to consoles though. Vikingr99 ? I've never heard before. A long wait, but it'll be worth it, I'm sure. But damn...I remember being excited for this at the beginning of last year. At least now I know I'll be able to play it. That's a really cool looking retro console in the image. I wonder if someone's gonna actually turn that into a real thing at some point. . . .
PS. I've never been a fan of bullet hell smumps—I love regular shmups though—but overall the game looks very cool. Pretty cool looking game. I'm not a fan of shoot-em-ups or the Adventure genre, but I might give this one a shot. You guys had an article awhile ago about this game. Thanks for the new one, I forgot the title and not that itch is scratched. Point and click adventure with a Shmup.... I'm sold. This looks awesome. I hope the 3D effect is in play here. @invictus4000 Dead? Lol. There have been TONS of great P&C adventures in the past ten years, but people STILL claim the genre's dead? I particularly love the audio in that trailer!! Looks good! Will check it out as things develop. Looks awesome. I love Shumps but man they can be tough and this looks like it will be just that. I was sure the game is hoax? @invictus4000 Hey, if that helps, there are smaller and independend point and click adventure games made with AGS (Adventure Game Studio). You may find something for you. I've had my sights on this one for a while, glad it's coming to the Wii U! I'll get it on that to support the platform. Nice pixelart, looks really interesting. That plane makes me think of Area 88. @invictus4000 Advanture games are Alive and kicking, take a gander on Steam or GoG, most of them have great pixel art, good stories so while the genre is not a booming as it was mid 90's it's from what it was around the turn of the century. this game looks great, a combination of schmup and point and click style adventure makes for an off mix that i can see work in a space opera like story. 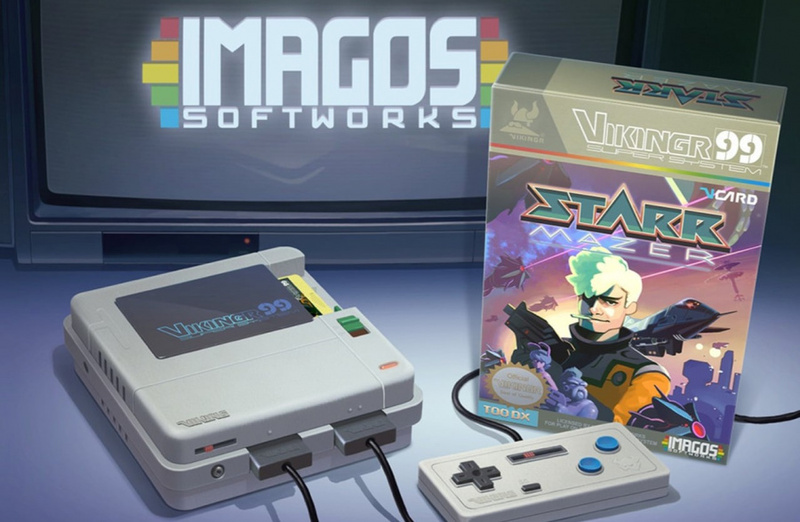 Rad looking game and awesome mix of two cool genres... sweet that it is coming to Nintendo consoles but NX will probably be out by the time this releases. Think I would prefer to play a point-and-click on, ya know, a PC anyway. Old school classic shoot'em'up more than welcome. This looks radical. Like an 8 bit shooter, with point and click, which reminds me a bit of Guardians of the Galaxy. SIGN ME UP! I hope that if its delayed, they'll also do an NX release, although I do plan on keeping my Wii U rather than trading it in.